For the Australian band, see Uncanny X-Men (band). For the eponymous team and various media properties, see X-Men. The title was created by Stan Lee and Jack Kirby, met with a lukewarm reception, and was eventually cancelled in 1970. Interest was rekindled with 1975's Giant-Size X-Men and the debut of a new, international team. Under the guidance of David Cockrum and Chris Claremont, whose 16-year stint began with August 1975's Uncanny X-Men #94, the series grew in popularity worldwide, eventually spawning a franchise with numerous spin-off "X-books", including New Mutants, X-Factor, Excalibur, X-Force, Generation X, the simply titled X-Men, and a number of prefixed titles such as New X-Men, Astonishing X-Men, Essential X-Men, All-New X-Men and Extraordinary X-Men. Created by writer-editor Stan Lee and artist Jack Kirby, the series launched in September 1963, introducing in its first issue the original five X-Men (Angel, the Beast, Cyclops, Iceman, and Marvel Girl) and their teacher, Professor X, as well as their nemesis, the supervillain Magneto. Although Lee would deny it, it was noticed by contemporary writer Arnold Drake, that the concept of the series emulated his own earlier series for National Periodical Publications's (Now DC Comics), The Doom Patrol, in many respects. However, National's editorial staff did not support Drake's concerns. Initially published bimonthly, it became a monthly with issue #14 (November 1965). Lee's run lasted 19 issues, and featured X-Men battling villains such as Magneto's Brotherhood of Evil Mutants which included the Scarlet Witch and Quicksilver; the Sentinels giant robots programmed to destroy all mutants, and their creator Bolivar Trask; and Juggernaut, Xavier's stepbrother transformed by a mystical gem and seeking revenge on Xavier. The series was placed firmly in the Marvel Universe, with guest appearances by Namor in #6 and the Avengers in #9. The jungle adventure hero Ka-Zar and the Savage Land were introduced in issue #10. Roy Thomas wrote the series from #20 (May 1966) to #44 (May 1968). Thomas and artist Werner Roth created the Banshee in #28 (Jan. 1967). The X-Men #45 (June 1968) featured a crossover with The Avengers #53 (June 1968). After brief runs by Gary Friedrich and Arnold Drake – the latter of which introduced the new X-Men Lorna Dane and Havok, and during which the series adopted a new logo designed by Jim Steranko – Thomas returned to the series with issue #55 and was joined by artist Neal Adams the following issue for an acclaimed run of stories. After a battle with the Hulk in issue #66 (March 1970), the title ceased publishing original material and featured reprints in issues #67 (Dec. 1970) through #93 (June 1975). X-Men was relaunched in May 1975 with Giant-Size X-Men #1, by Len Wein and Dave Cockrum. The title featured a new, international team consisting of Cyclops, Banshee, Sunfire and Wolverine, along with new characters Storm, Nightcrawler, Colossus and Thunderbird. The original plan was to continue Giant-Size X-Men as a quarterly, but instead original stories were printed in the book, again initially bimonthly.Chris Claremont's first issue as writer, #94, featured all the original X-Men leaving the team with the exception of Cyclops. Sunfire also left, having agreed to assist the X-Men on one successful mission only. Thunderbird was killed in #95. Moira MacTaggert, a human ally of the X-Men, and later to be established as a former fiancée of Xavier, debuted in #96. Marvel Girl became the Phoenix in issue #101. This was followed by the first Shi'ar space opera story. Cockrum was replaced as penciller by John Byrne as of #108. Byrne became co-plotter, and during his run the series became a monthly title again. The series title was changed to The Uncanny X-Men with issue #114 (October 1978). For the remainder of the decade the X-Men fight enemies such as Stephen Lang and his Sentinels, Magneto, Banshee's cousin Black Tom and the Juggernaut, the Shi'ar Erik the Red and the Imperial Guard, Arcade, Wolverine's former colleagues, Canadian superhero team Alpha Flight, and MacTaggert's son Proteus. In 2010, Comics Bulletin ranked Claremont and Byrne's run on The X-Men second on its list of the "Top 10 1970s Marvels". The "Dark Phoenix Saga" in 1980 led to a change in the line-up of the team, with the death of Phoenix (Jean Grey), and Cyclops leaving the team to mourn her. Comics writers and historians Roy Thomas and Peter Sanderson observed that "'The Dark Phoenix Saga' is to Claremont and Byrne what 'the Galactus Trilogy' is to Stan Lee and Jack Kirby. It is a landmark in Marvel history, showcasing its creators' work at the height of their abilities." The storyline also saw the introduction of recurring antagonists the Hellfire Club, and its Inner Circle consisting of Sebastian Shaw, Emma Frost, Harry Leland, Donald Pierce, along with Mastermind, previously a member of Magneto's Brotherhood. Teenage mutant Kitty Pryde was introduced in #129 (Jan. 1980) and joined the X-Men in #139. Dazzler, a disco-singing, roller-skating mutant, was introduced in #130 (Feb. 1980), but did not join the team, instead having a solo title. A new Brotherhood of Evil Mutants, led by Mystique, was introduced in the "Days of Future Past" storyline (#141-#142, Jan–Feb 1981) in which a time-travelling Kitty Pryde tried to avert a dystopian future caused by the Brotherhood assassinating Presidential candidate Senator Robert Kelly. Byrne plotted the story wanting to depict the Sentinels as a genuine threat to the existence of the mutant race. He then left the series after #143, being replaced by a returning Cockrum, who in turn was succeeded by Paul Smith and John Romita Jr.
By the mid-1980s The Uncanny X-Men had become one of the best-selling American comic books, turning many of the writers and illustrators into industry stars and leading to numerous spin-offs and miniseries. Magneto was gradually revealed to be more complex: #150 established that he was a survivor of the Holocaust, and in #161 it is shown that Magneto and Professor Xavier had known each other before Xavier had founded the X-Men. Rogue, a member of Mystique's Brotherhood, defected to the X-Men in #171 (July 1983). Mystique's Brotherhood changed sides and became the government-backed Freedom Force in #199. Their first action was to capture Magneto, who had begun associating with the X-Men during the "Secret Wars II" crossover. Magneto surrenders himself, but escapes after his trial is abandoned, he takes over the headmastership of the school after Xavier leaves for space in #200 (Dec. 1985). The Morlocks, a group of disfigured mutants living underneath New York City, were introduced in #169 (May 1983). Storm became their leader in #170. She was de-powered accidentally by government forces aiming for Rogue, and met Forge, a mutant with the power of invention. After Storm left the team temporarily to return to her native Africa, Nightcrawler became field leader. The character Rachel from the future dystopia presented in "Days of Future Past" had been shown to arrive in the present day in New Mutants #18, and then made appearances in Uncanny from #184 and was revealed to be Cyclops's daughter. Claremont attempted to write Cyclops out of the series, by having him marry Madelyne Pryor in #175 (Nov. 1983); she gave birth to his son in #201 (Jan. 1986). The X-Factor series was launched two months later and featured the original five X-Men. This meant the resurrection of Jean Grey (performed by retcon, the character appearing from #101 having never really been her), and having Cyclops abandon his wife and child. Claremont strongly objected to the latter, and was hostile towards the title until Louise Simonson became writer. Artist Arthur Adams began a long association with the team by drawing The Uncanny X-Men Annual #9 (1985) and would serve as the artist on several of the annuals in the next few years. The end of 1986 saw the first crossover between X-Men titles, the "Mutant Massacre", which saw a large number of Morlocks killed by the Marauders, acting under orders from the mysterious Mister Sinister. The late 1980s saw several other cross-overs: 1988's "Fall of the Mutants" and 1989's "Inferno", which resolved the issue of Madelyne Pryor by revealing her to have been a clone of Jean Grey created by Sinister. The cast was shaken up, with the addition of Psylocke, Dazzler, Longshot and Havok in early 1987, as well as the first appearances of NPR-TV reporter Manoli Wetherell in #226 (1988), new teenage mutant Jubilee in #244 (1989), Forge in #255 (1989), and Gambit in Uncanny X-Men Annual #14 (1990). The X-Men left their traditional residence in Westchester County, New York, and lived variously on Alcatraz, Muir Island and in the Australian outback. The "X-Tinction Agenda" crossover, in which the X-Men, X-Factor and the New Mutants fight against the Genoshan government for mutant rights, was published in the fall of 1990. The title became twice-monthly from 1988 to 1990, and helped to launch the careers of artists Marc Silvestri and Jim Lee. In 1991 another X-Men title was launched, titled simply X-Men; both titles were now published monthly. Claremont wrote the first three issue of this series, in which the X-Factor and X-Men teams reunited with Professor Xavier at the school. 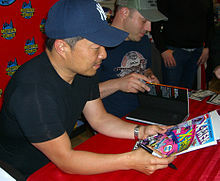 Claremont left Marvel after disputes with Bob Harras and artist Jim Lee (of X-Men). Claremont's final issue of Uncanny was #279, during the "Muir Island Saga", which is set before those events. After Claremont's run, the X-Men were divided into two color-coded squads, with a Blue team headlining the adjectiveless X-Men title, while the Gold team, consisting of Archangel, Colossus, Jean Grey, Iceman and Storm, appeared in Uncanny. This roster was later joined by Bishop, another refugee from the future. After Claremont's departure, Jim Lee continued as plotter, while John Byrne scripted from #281 to #286. Byrne was replaced as scripter from #287 by Scott Lobdell, who was fully credited as writer from #289. The "X-Cutioner's Song" crossover was released in the fall of 1992 and resulted in the outbreak of the Legacy virus, a mutant-specific plague which continued as a story element in X-Men comics until 2001. Crossovers continued through the 1990s. The "Fatal Attractions" crossover of 1993 saw the X-Men battle Magneto again, and the "Phalanx Covenant" story of 1994 focused mostly on the techno-organic Phalanx. Uncanny briefly ceased publication during the "Age of Apocalypse" storyline in 1995, which dealt with an alternative present created by a time travelling assassin killing Xavier; it was replaced by Astonishing X-Men. Lobdell was writing X-Men as well from 1995. Lobdell was replaced by Steven T. Seagle with issue #350 (Dec. 1997). He was replaced in turn with Alan Davis, as plotter, from issue #366 (Mar. 1999) to #380. Davis's run included "the Twelve" crossover from #370-#375, in which Apocalypse sought the only twelve mutants, which also ran in his X-Men title, again being treated as a biweekly publication. 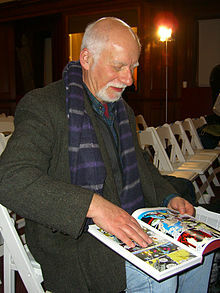 As part of the Revolution relaunch, Chris Claremont made a brief return from #381 (June 2000) to #389, at which point he transferred to the new X-Treme X-Men title, as Grant Morrison took over the X-Men vol. 2 and that became the flagship X-Men title. From 2001 Lobdell made a short return, and then Joe Casey and Chuck Austen wrote runs into 2004. The title became bimonthly from 2003 to 2004. The X-Men: Reload reshuffle of titles in 2004 led to Claremont returning to Uncanny with issue #444. The stories addressed the new status quo established by Morrison. Claremont remained until #473. His final story was "End of the Greys" in 2006, as part of the "Decimation" storyline, where the vast majority of mutants had lost their powers. He was replaced by Ed Brubaker, who wrote a 12-part epic space opera story "The Rise and Fall of the Shi'ar Empire", as a follow-up to his miniseries X-Men: Deadly Genesis. After this the title led into the "Messiah Complex" crossover event, dealing with the first mutant birth since the Decimation. Matt Fraction became co-author from #500, and sole author from #504. The entire X-Men team relocated to San Francisco – firstly to the city, and then, after the "Utopia" crossover with Dark Avengers, to an island named Utopia in San Francisco Bay. The Nation X storyline focused on the return of the re-powered Magneto, and him coming to Utopia. The Second Coming crossover saw the return of Hope Summers, the baby from the "Messiah Complex" arc, to the present day, as a young adult; and the emergence of the "Five Lights", the first new mutants to have arisen (apart from Hope) since the Decimation. Nightcrawler was killed during this storyline and Beast left in protest after his discovery of Cyclops's secret death squad X-Force. Kieron Gillen took over co-authorship of the series with #531, and became sole writer from #534.1. The original series ended with #544 and relaunched as a new volume after the events of the X-Men: Schism miniseries, wherein half the X-Men, led by Wolverine, returned to New York, to found a new school. The new volume featured the Extinction Team, containing members of the X-Men whom Cyclops had retained to deal with potential threats to the mutant race's survival. Gillen's run led into and crossovered with the "Avengers vs. X-Men" storyline and finished with issue #20 in October 2012. The volume ended with Cyclops, who had become increasingly hardline during Gillen's run, in prison for his actions during that storyline. Gillen wrote a five-part epilogue, AvX: Consequences. As part of Marvel NOW!, a new volume of Uncanny X-Men was launched in February 2013 with an April 2013 cover date, written by Brian Michael Bendis, who is also writing another X-Men title, All-New X-Men, and drawn by Chris Bachalo. It features Cyclops and remnants of his Extinction Team recruiting new mutants to help them prepare for what Cyclops believes to be an inevitable revolution, coinciding events of the first All-New X-Men story arc. This volume saw Cyclops leading his team to an abandoned Weapon X facility to train new recruits and prepare for impending war against humans who see Cyclops as a terrorist due to his actions in Avengers Vs. X-Men. Eventually Kitty Pryde and the time-displaced X-Men join his cause after facing a team of X-Men from a dystopian future. It lasted 36 issues, with the final issue reverting to the legacy numbering of Uncanny X-Men (vol. 1) #600. As part of All-New, All-Different Marvel, Uncanny X-Men was relaunched, written by Cullen Bunn with art by Greg Land. The relaunched Uncanny X-Men team features Magneto leading Psylocke, Archangel, M, Mystique, Fantomex and Sabretooth while a different team led by Storm will be called the Extraordinary X-Men. Cyclops's fate after Battleworld is shown to us in the Death of X miniseries. (Cyclops was exposed to the Terrigen Mist and died from M-Pox.). The tagline for the relaunched series is "Bigger threats require more threatening X-Men", and is considered to be a continuation of Bunn's previous work on the Magneto solo series. The series will deal with threats that arise as a result of a new, more dangerous world post-Secret Wars. Summing up the team, Bunn states "They're upholding Xavier's dream, but they have no right to do so.". Announced in August 2018, Uncanny X-Men Vol. 5 debuted November 14, 2018, with the weekly 10-part "X-Men: Disassembled" arc. Like many comic book series, Uncanny X-Men had an associated double-sized annual series, once in both 1970 and 1971, then regularly from 1979 to 2001. A second series of Uncanny X-Men Annual began in 2006 as volume 2, issue #1. #67–93 1970–1975 The comic continued publication only as reprints of earlier stories, Uncanny X-Men wasn't picked up for 5 years. #251–272 1989–1991 The X-Men are disassembled. The issues variously feature individual characters or small groups who have previously been X-Men or been affiliated with the X-Men. Generation X forms as Banshee, White Queen, Jubilee, and Sabretooth protect Blink, M, Husk, Synch, and Skin from the Phalanx. The series was replaced with Astonishing X-Men for four months during the event. It featured Blink, Morph, Rogue, Sabretooth, Sunfire, and Wild Child. After Professor X briefly disbands the team to expose the Skrull infiltrator, the team learns of the Twelve. As Apocalypse's plans come to fruition, many X-Men, as well as the members of the Twelve, come together to battle him, even as he warps reality. #379–380 2000 All mutants worldwide are rendered powerless by the High Evolutionary and Mr. Sinister, leading to an interim team battling them after the X-Men briefly disband. #392–393 2001 "Eve of Destruction" crossover: While Cyclops and Wolverine infiltrate Genosha to save Professor X, Jean Grey forms an interim team composed of Dazzler, Northstar, Omerta, Sunpyre, Wraith, and a mind-controlled Frenzy. The whole team comes together under Cyclops to protect Hope Summers. Also featuring the debut of the new X-Force team, consisting of Caliban, Hepzibah, Warpath, Wolfsbane, Wolverine, and X-23. #495–499 2008 Although divided, the team gradually starts to reform in San Francisco. All the mutants in San Francisco battle against Norman Osborn's Dark Avengers and the group of Dark X-Men he forms under the Black Queen, including Cloak and Dagger, Daken, Dark Beast, Mimic, Mystique (posing as Professor X), Namor, and Weapon Omega. The X-Men of the Jean Grey School, Cyclops' X-Men team, the time-displaced original X-Men from the past, and X-Men from the future fights the Brotherhood team from the future. This is an article about the comic book, and thus the publication history, not the in-continuity history. As such, the above reflects the team roster for the book at time of publication. Similarly, this article only reflects the team roster for the X-Men team whose home is this publication. Professor X is the Headmaster of Xavier's School for Gifted Youngsters and mentor to the X-Men, but he is rarely (if ever) a member of the X-Men team. In his role as mentor he has typically been present in the book, but he has notable absences including issues #43–64 (dead, later retconned as preparing for the Z'Nox), #200–273 (with Lilandra Neramani in Shi'ar space; replaced as Headmaster by Magneto during most of this absence), #340–351 (in government custody after the Onslaught crisis), #379–386 (educating Cadre K in space), and #495–513 (rebuilding his mind in X-Men: Legacy). Jean Grey was replaced by the Phoenix Force from issue #101 through #137. This was a retcon that was only revealed years later. At many times the team roster has been the same as that appearing in X-Men (vol. 2), and during two periods the two books have even been treated by their writer as a single bi-weekly title (issues #289–350 by Scott Lobdell and issues #366–380 by Alan Davis). During issues #370–372 Wolverine was replaced by a Skrull infiltrator, leading to "The Shattering"/"The Twelve" storylines, and the Astonishing X-Men (vol. 2) limited series. After moving to San Francisco, many other mutants continually appear as background characters or allies, but apart from during crossovers they are rarely considered part of the team roster. After the series was relaunched as Uncanny X-Men #1, it featured Cyclops's "Extinction Team", composed of himself, Emma Frost, Namor, Magneto, Storm, Hope Summers, Colossus, Danger and Magik; Psylocke was briefly a member of this team while Emma was injured. Until 2011, Uncanny X-Men remained Marvel Comics' only Silver Age title to retain its consecutive issue numbering since its conception, even during the early 1970s reprint hiatus. The Amazing Spider-Man, The Avengers, Fantastic Four and other legacy titles have all, at one time or another, restarted their numbering at #1, though all later returned to their original numbering. The final issue to be published under the original numbering was #544, published in October 2011 with a December 2011 cover date, which was followed by a new #1 the following month. In 2015, Marvel released Uncanny X-Men #600, following Vol. 3 #35, as a conclusion to the Brian Michael Bendis' run on both "All New X-Men" and Vol. 3. From issue #1 through #93 the indicia title was The X-Men. After the relaunch with issue #94, and up to #138, the article The was dropped from the indicia title, making it X-Men, but the article was added back in issues #139 to #141. 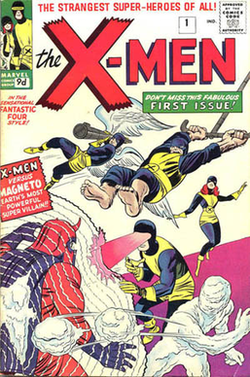 The title The Uncanny X-Men was first used in the issue #95 title block following the "Stan Lee Presents:" tagline, though the title did not appear on the covers or indicia titles yet. Covers begin displaying this title in #114. Beginning with issue #142, and up to #407, the indicia title was finally changed to The Uncanny X-Men. Issue #408 was the first to use the indicia title Uncanny X-Men. A separate series, titled simply X-Men, launched with an October 1991 cover date. ^ Daniels, Les (1991). "The Marvel Age (1961–1970)". Marvel: Five Fabulous Decades of the World's Greatest Comics. New York, New York: Harry N. Abrams. p. 111. ISBN 9780810938212. The X-Men, a comic book series featuring a very different sort of superhero group, made its debut simultaneously with The Avengers in September 1963. ^ DeFalco "1960s" in Gilbert (2008), p. 99: "Stan Lee and Jack Kirby decided to try their hands at a pair of reluctant super villains when they created the Scarlet Witch and Quicksilver in The X-Men #4." ^ DeFalco "1960s" in Gilbert (2008), p. 107: "Originally created for pulp magazines, and then used in Marvel Comics #1 (Oct. 1939), Ka-Zar the Great was brought up by tigers...When Stan Lee and Jack Kirby revived the character, they also paid homage to...[Edgar Rice] Burroughs' ideas: The dinosaur-filled Savage Land is based on Burroughs' Savage Pellucidar." ^ DeFalco "1960s" in Gilbert (2008), p. 120: "Writer Roy Thomas wanted to introduce mutants from other countries into the X-Men. His first attempt was Banshee...Drawn by Werner Roth, Banshee was a former Irish Interpol agent who eventually joined the X-Men." ^ a b c d e DeFalco, Tom (May 2006). Comics Creators on X-Men. London, United Kingdom: Titan Books. ISBN 978-1-84576-173-8. ^ DeFalco "1960s" in Gilbert (2008), p. 132: "Lorna Dane's green hair marked her as a mutant...in The X-Men #49, an issue written by Arnold Drake and illustrated by Don Heck and Werner Roth." ^ DeFalco "1960s" in Gilbert (2008), p. 135: "Alex [Summers] was the younger brother of the X-Man Scott 'Cyclops' Summers. He appeared in The X-Men #54, by writer Arnold Drake and artist Don Heck." ^ Schumer, Arlen (Winter 1999). "Neal Adams: The Marvel Years". Comic Book Artist. Raleigh, North Carolina: TwoMorrows Publishing (3). Archived from the original on April 22, 2014. Retrieved May 12, 2013. ^ Sanderson, Peter "1970s" in Gilbert (2008), p. 145: "Writer Dennis O'Neil revealed that it was not Xavier who had perished but a shape-shifter called the Changeling...This epic tale provided an appropriately grand finale for the work of legendary artist Neal Adams." ^ Sanderson "1970s" in Gilbert (2008), p. 145: "[X-Men #66] would be the series' last issue by writer Roy Thomas and artist Sal Buscema." ^ Sanderson "1970s" in Gilbert (2008), p. 169: "[Editor Roy] Thomas realized that if X-Men was to be successfully revived, it needed an exciting new concept. Thomas came up with just such an idea: the X-Men would become an international team, with members from other countries as well as the United States. Writer Len Wein and artist Dave Cockrum were assigned to the new project and the result was Giant-Size X-Men #1." ^ Sanderson "1970s" in Gilbert (2008), p. 176: "Writer Chris Claremont and artist Dave Cockrum's intent in transforming Jean Grey into Phoenix was to boost Jean's powers to a higher level"
^ Daniels "The Marvel Universe (1978–1990)", p. 186: "The controversial story created a sensation and The X-Men became the comic book to watch." ^ DeFalco "1980s" in Gilbert (2008), p. 196: "In January  a nine-part story began that changed the X-Men forever...Claremont proposed a story that would show how Jean Grey – one of the original members of the X-Men – had become corrupted by her new Phoenix power. ^ Cooke, Jon B.; Nolen-Weathington, Eric (2006). Modern Masters, Vol. 7: John Byrne. Raleigh, North Carolina: TwoMorrows Publishing. pp. 31–32. ISBN 978-1893905566. I came up with a Sentinels story where the Sentinels had taken over the world and killed everybody. That's about as tough as you get right? ^ Thomas and Sanderson, p. 137: "The Uncanny X-Men remained something of a cult book, with a small but devoted following, but as the 1980s continued, sales went up and up. By mid-decade, it was consistently the top-selling comic book not simply at Marvel but in the entire American comics industry." ^ DeFalco "1980s" in Gilbert (2008), p. 218: "A brilliant weapons inventor Forge was the man the government hired when Tony Stark stopped building munitions." ^ Khoury, George; Nolen-Weathington, Eric (2006). Modern Masters, Vol. 6: Arthur Adams. Raleigh, North Carolina: TwoMorrows Publishing. p. 28. ISBN 978-1893905542. ^ DeFalco "1980s" in Gilbert (2008), p. 228: "The Mutant Massacre was an eleven-issue story that ran from October 1986...Working for Mister Sinister the Marauders – a team of mutant mercenaries – raided the Alley and callously slaughtered most of the Morlocks." ^ DeFalco "1980s" in Gilbert (2008), p. 236: "'The Fall of the Mutants' was actually three separate stories – one in each of the X-Men titles." ^ Cronin, Brian (October 18, 2013). "Comic Book Legends Revealed #441". Comic Book Resources. Archived from the original on August 21, 2014. Longtime X-Men fans might recall how Chris Claremont used real-life National Public Radio personalities Neal Conan and Manoli Wetherell in X-Men comics. ^ Manning, Matthew K. "1990s" in Gilbert (2008), p. 249: "[Storm] encountered one of the most popular X-Men of the 1990s the enigmatic thief called Gambit. Created by legendary X-scribe Chris Claremont and artist Michael Collins, Gambit's Southern charm, thick Cajun accent, and ability to supercharge objects with kinestic energy for explosive results won over the readers." ^ Manning "1990s" in Gilbert (2008), p. 251: "With a marketplace primed for flashy event-orientated stories, the X-Men titles took full advantage with their epic crossover, 'X-Tinction Agenda'." ^ Manning "1990s" in Gilbert (2008), p. 255: "X-Men #1 [was] the best selling comic book in the history of the medium, selling well over eight million copies." ^ a b c d Sjoerdsman, Al; Vandal, Stuart; York, Jeph. Official Index to the Marvel Universe: The Uncanny X-Men. Marvel Comics. ISBN 978-0-7851-4958-3. ^ Manning "1990s" in Gilbert (2008), p. 255: "Created by writer John Byrne and artist Whilce Portacio, Bishop found himself traveling back in time to the 20th century and coming face to face with the X-Men." ^ Manning "1990s" in Gilbert (2008), p. 261: "The 'X-Cutioner's Song' [was] an epic twelve-part crossover showcasing the various X-teams' battle with the Cable-clone Stryfe." ^ Manning "1990s" in Gilbert (2008), p. 272: "The 'Age of Apocalypse' was a major crossover event that drastically changed the landscape of the universe that the X-Men existed in." ^ Manning "2000s" in Gilbert (2008), p. 306: "Renaming the X-Men comic New X-Men, Morrison ignored the convoluted plot threads that had seemed to plague the X-family of books for years, and instead focused on the original idea of a mutant school." ^ Callahan, Timothy (July 21, 2008). "Review: Uncanny X-Men #500". Comic Book Resources. Archived from the original on May 12, 2013. ^ Callahan, Timothy (May 19, 2009). "Review: Uncanny X-Men #510". Comic Book Resources. Archived from the original on May 12, 2013. ^ Schedeen, Jesse (December 16, 2009). "X-Men: Magneto's Utopia". IGN. Archived from the original on May 12, 2013. ^ Pepose, David (April 29, 2010). "Dial H for History: Nightcrawler, Conscience of the X-Men". Newsarama. Archived from the original on May 12, 2013. ^ Ekstrom, Steve (February 25, 2010). "Revelation X: Matt Fraction Talks Uncanny & Second Coming". Newsarama. Archived from the original on May 12, 2013. ^ Ching, Albert (September 23, 2010). "Fraction and Gillen on Their Uncanny X-Men Team-Up". Newsarama. Archived from the original on May 12, 2013. ^ Ching, Albert (January 24, 2011). "Fraction and Gillen Explain It All (Thor, Journey, X-Men)". Newsarama. Archived from the original on May 12, 2013. ^ Mase, Poet (October 19, 2011). "Uncanny X-Men #544 Review". IGN. Archived from the original on May 11, 2013. ^ Sunu, Steve (October 23, 2012). "X-Position: Gillen Wraps Uncanny X-Men". Comic Book Resources. Archived from the original on May 12, 2013. ^ Gillen, Kieron (October 17, 2012). "Many Comics Available for Purchase". Archived from the original on May 12, 2013. ^ White, Brett (August 1, 2012). "Marvel NOW! Q&A: All-New X-Men". Marvel Comics. Archived from the original on May 12, 2013. Retrieved August 9, 2012. ^ Sunu, Steve (November 8, 2012). "Bachalo Confirms Uncanny X-Men Relaunch". Comic Book Resources. Archived from the original on May 12, 2013. Retrieved November 8, 2012. ^ a b "Uncanny X-Men & X-Men SDCC Panel". ComicsBlend.com. n.d. Archived from the original on September 20, 2015. Retrieved July 12, 2015. ^ Marston, George (August 10, 2018). "UNCANNY X-MEN #1 Will 'DISASSEMBLE' This November". Newsarama.